This week I provide a few tips to get the most out of the BeerSmithRecipes.com cloud site. I launched the BeerSmith Recipes site almost three years ago and it has grown to a collection of over 300,000 beer recipes making it perhaps the largest beer recipe site on the internet. The easiest way to get started with the BeerSmith cloud site is to go to BeerSmithRecipes.com and click on the register button to set up a free account. 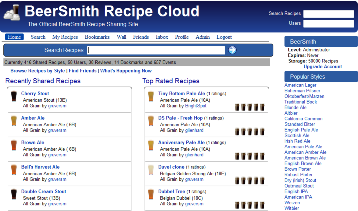 Your account and cloud recipes can be viewed from the web by logging in to BeerSmithRecipes.com from any web browser. The cloud is also fully integrated with BeerSmith home brewing software as well as the BeerSmith Mobile app for Android, Kindle, iPhone or iPad. Once you have your BeerSmithRecipes account set up you can log into it from either the desktop or mobile app as well. Your free account includes space for 15 recipes. Many users manage that space by keeping most recipes locally on their desktop or phone and then using the cloud space for transferring recipes between devices or for storing the recipes currently being worked on. From the web site you can access your stored recipes using the “recipes” link on the menu bar after logging into BeerSmithRecipes.com. The desktop and mobile versions of BeerSmith have a separate Cloud view which gives you access to your cloud folder. Again you need to provide your cloud login the first time you use the cloud folder, but the program will remember your user name and password after that. If needed you can also purchase additional cloud space starting at under $1/month by going to the BeerSmithRecipes upgrade page. Upgrading your account also gives you access to additional features including automatic archiving of your cloud recipes (accessible from the BeerSmithRecipes web site). From BeerSmithRecipes.com you can use the search box at the top of the page to find new recipes. The site searches tens of thousands of shared recipes other brewers have created on the site. You can refine and sort your results by rating or other parameters using the search modifiers on the left of the results page. When you find a recipe you like you can use the ‘store a private copy’ link to keep a private copy in your cloud folder, which you can later scale and use in BeerSmith. You can also search for new recipes using the Cloud Search views available from both BeerSmith Mobile and BeerSmith desktop. These views are convenient since you can save a copy right into your cloud or local accounts directly from the in-app search views. Since all versions of BeerSmith have a recipe scaling feature you can then take any recipe you have found and scale it to match your equipment and brew it as described below. After you have found a BeerSmith recipe and created a private copy in your account, you can use either your BeerSmith mobile app or BeerSmith desktop program to scale the recipe to match your equipment and then brew it. First you need to create an equipment profile if you don’t already have one to match your equipment in BeerSmith. There are video tutorials on how to do this for both BeerSmith desktop and BeerSmith mobile on my video tutorial page here. Once you have a good equipment profile matching your personal equipment setup, you can use the scale recipe command in either BeerSmith mobile or BeerSmith desktop to scale your recipe size to match your equipment. This is as simple as opening the recipe, choosing the scale recipe command and choosing your new equipment profile within the scale recipe dialog. The program will scale all of the ingredients and instructions to match your particular equipment for the given recipe. Again there are tutorials on using scale recipe for both versions here. Finally both BeerSmith desktop and BeerSmith mobile have a brewday timer built in, so you can use the timer with your newly scaled recipe to monitor progress and track ingredients on brew day. A critical feature of the BeerSmithRecipes site is that all recipes in your cloud folder are private by default, meaning that only someone using the same login and pasword for your account can access your recipes. However, with just a click of a button you can mark any recipe as shared, which lets other brewers find and use your recipe. Sharing your recipe also lets other brewers comment and rate your recipe so you can get feedback. To share a recipe from the web site, simply log into your BeerSmithRecipes.com account, open the recipe and click on the link to ‘Mark it as shared’. From within BeerSmith, you can go to your Cloud folder and select any recipe and use the Shared/Private button (large icon looks like a lock) to toggle the selected recipe between shared and private. From the mobile app you can also open any recipe within your cloud folder and use the button near the bottom of the recipe to mark it as shared or private. Sharing a good recipe is a great way to give back to the brewing community and also lets your friends find and download your best recipes so they can brew it as well. You can also use the BeerSmith cloud to transfer profiles, equipment and ingredients between machines or to your mobile device. The basic process is to include the items you want in a recipe, and then open the recipe on your remote copy and view then save the individual profiles or equipment. There is a video showing you how to do this with your desktop and mobile versions here. I’ve only scratched the surface of what you can do with BeerSmithRecipes.com – it also has features for following other brewers, sharing recipe links via social media sites like facebook and twitter and much more. There are a number of videos here on using the cloud and also the mobile and desktop version. I’ll follow up with another article in the future covering additional tips. Awesome stuff Brad. Did not realise it was possible to get equipment and other profiles into the mobile device like this. Very cool, now I can create a recipe from scratch on the mobile device, which Ive actually found to be quicker than desktop in some cases. Thanks!